I am unable to be here in person but request that this letter be submitted as evidence in the judicial proceedings regarding nonviolent demonstrations by Ms Kang Young-sil, Ms Choi Sung-Hee and Dr Song Kang-ho at the Hotel Shilla, November 7-8, 2011. 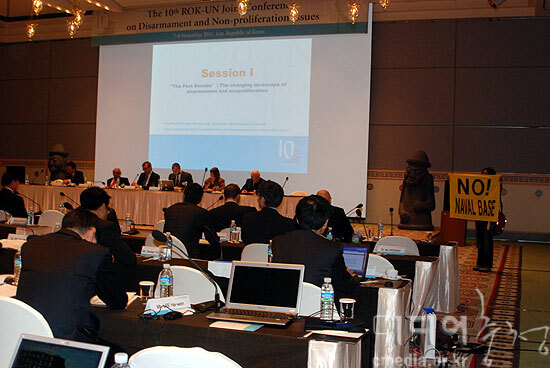 I, Dr Rebecca Johnson of the above address in London UK, was an invited participant at the 10th ROK-UN Joint Conference on Disarmament and Non-Proliferation Issues: The Past and Future of Disarmament and Non-Proliferation, which was held at the Shilla Hotel, Jeju, November 7-8, 2011. I flew from London for this Conference, and was asked to serve both as an expert presenter and a rapporteur for one of the sessions. As a panel speaker, I was on the Conference platform when a young woman quietly and peacefully entered the room and held up a yellow banner with the message “No Naval Base”. Indeed, the speaker who was presenting at the time, Professor Han Yong-sup, drew attention to this protest, which was part of a larger but equally nonviolent demonstration at the entrance of the Conference. Like others in the Conference, I was interested to learn more about the concerns that the protesters were raising, and asked questions about this in conversations with several of the participants from the South Korean Ministry of Foreign Affairs and diplomatic service, many of whom are my long-standing friends from many years of collaborative work on security, non-proliferation and disarmament issues. The protest sparked some interesting and informative discussions, but at no time did I or anyone else in the Conference feel worried, alarmed or threatened by the protesters, who behaved completely nonviolent throughout. I was therefore shocked to be told after the Conference concluded that three of the protesters had been arrested, taken into custody and held overnight. I was even more dismayed when I heard that these two women and religious brother had been hurt and injured by police or hotel staff in the course of that unnecessary arrest. The Conference was on issues of security, disarmament and non-proliferation, and I think it was completely relevant and legitimate for nonviolent demonstrators to try to participate and inform us about a local issue – happening so close to the hotel we were meeting in. Freedom of protest and freedom of speech are important characteristics and rights in democracies, and it should have been important to guarantee these rights and enable citizens such as the Gangjeong protesters to exercise these rights without being hurt or arrested. The protesters invited the Conference participants to visit Gangjeong and see for ourselves the environmental and humanitarian desecration being caused by the construction of the unnecessary naval base. As I had time the next day, I visited Gangjeong and spoke with many of the villagers and concerned South Korean citizens. I was deeply concerned at the environmental destruction and that explosives were being laid in preparation for blowing apart the Gureombi. Over dinner on Monday evening (November7), our host, the Governor of Jeju, the Honourable Mr Woo Keun-Min, called Jeju an “Island of World Peace” and expressed his hope that Jeju would be designated one of the new Seven Wonders of Nature. His hopes seem to be completely contradicted by what I saw being done to Gangjeong as part of the construction of the naval base for Aegis destroyers (associated with the launch of armed missiles as part of a ‘missile defence’ force). 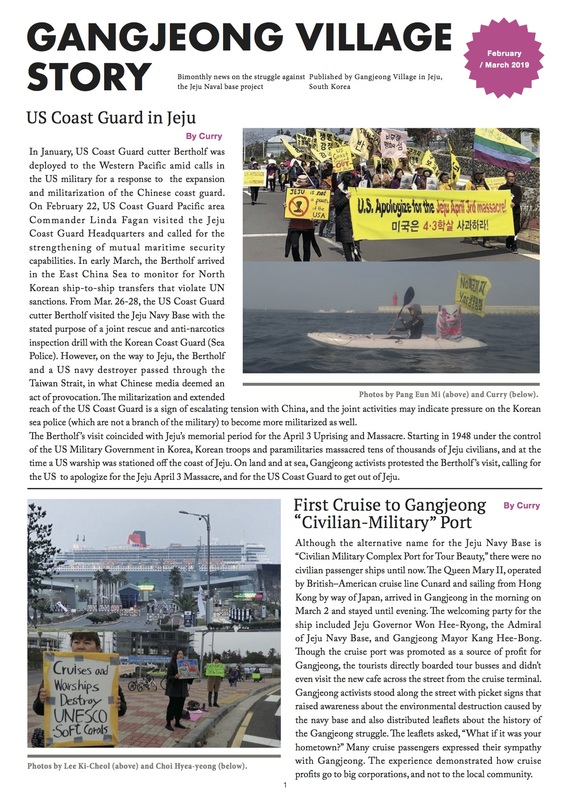 I was not distressed by Ms Kang Young-sil, Ms Choi Sung-Hee, Dr Song Kang-ho or any other of the nonviolent protesters who came to talk to us about the naval base. On the contrary, they gave me information that I consider important and relevant to my reasons for being at the UN-ROK Conference. I was, however, very distressed that they were arrested and have been charged for this, as if they had done something wrong or criminal. I am unable to travel back to Jeju to act as a witness in trial proceedings on this matter, but I respectfully request that this letter be used in evidence on behalf of Ms Kang Young-sil, Ms Choi Sung-Hee and Dr Song Kang-ho, confirm‍ing that their exercise of freedom of speech and demonstration during the UN-ROK Conference November 7-8 2011 should not constitute any kind of offence in a democracy such as the Republic of Korea.